Istanbul boasts thousands years of cosmopolite history. This multicultural heritage from the Ottoman and Byzantine era finds its reflection even while shopping in Istanbul. Formerly, I wrote a post regarding the best shopping centers on this blog page and I listed the modern shopping malls in Istanbul. 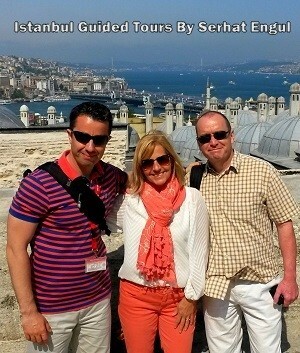 In this post, we will focus on the neighborhoods, streets, bazaars and historic passages of Istanbul. Although shopping centers were the main attractions when they were recently opened, people miss the feeling of doing shopping outdoors these days. Therefore, we witness that the relatively new shopping malls include parts that enable visitors to enjoy outdoor shopping experience even inside a shopping mall. It’s only natural that people who work indoors wish to spend their free time outdoors. However, it’s not possible to reflect the nostalgic and mystic atmosphere that has been created in years. Thus, in this post, I will mention the historic passages that came to life in Beyoglu due to the development of the neighborhood in 19th Century, old bazaars, and the streets that define Istanbul’s character today. 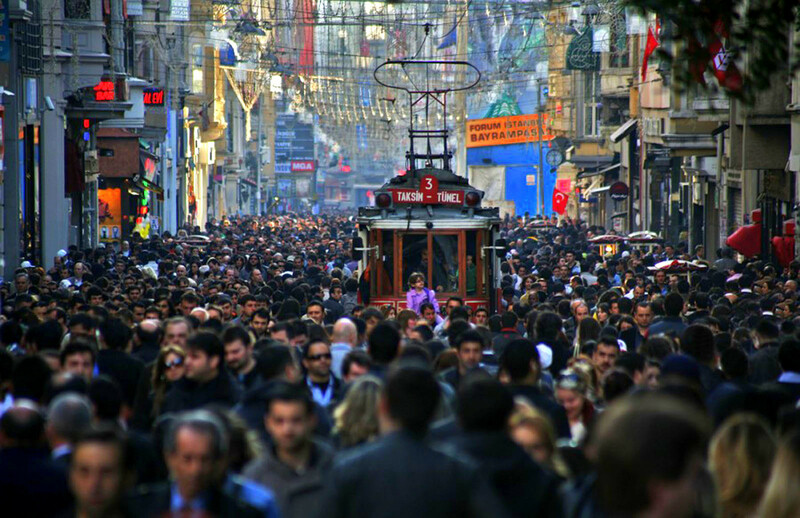 Istiklal Avenue is still a point of attraction although it is mentioned in news related to some undesirable news. With a rapid development, Beyoglu (Pera) reached a point where it could compete with other European cities in the 19th century, the last age of the Ottoman Empire. Consulates, banks, hotels, and business centers that were opened in the area put Beyoglu under the spotlight and the richest non-Muslims in the city competed among each other to create fancy buildings in the neighborhood. Although we may neglect to appreciate the architectural beauty of the buildings on Istiklal Avenue while window shopping the colorful shops, these buildings still remind us of the nostalgic life in Beyoglu. 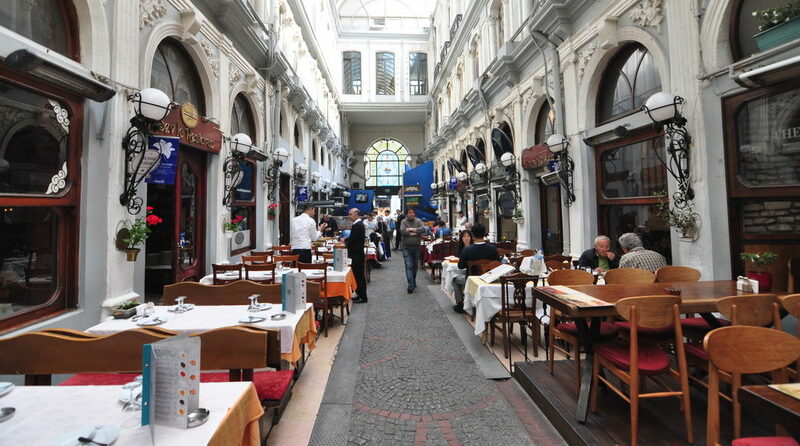 In a similar fashion, passages on Istiklal Avenue were built in the second half of the 19th century too. After Sultan Abdulmecid moved to Dolmabahce Palace as his residence, the dynamism of Beyoglu began to surpass the Old City. 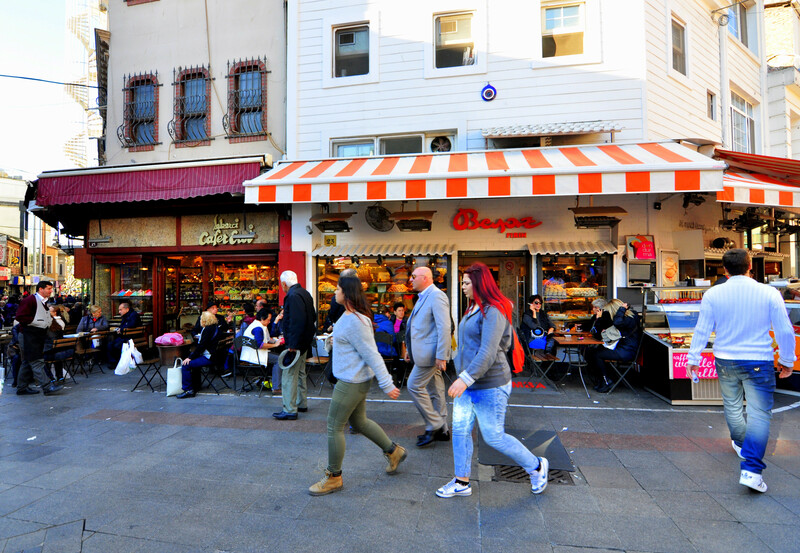 It would be fair to say that Beyoglu, which used to be known as “Grand Rue de Pera” among the Istanbulites, is becoming more and more popular thanks to its neighborhoods such as Galata, Cihangir, and Karakoy. Atlas Passage was built by Agop Koceoglu in 1870. Koceoglu was a prominent figure of the Armenian community in Istanbul and he was even a personal friend of the Sultan. With its high ceilings, frescoes, and golden leaf, the building stands out as one of the most beautiful buildings of its age. The building was used as PTT (Post Office Department) Head Office for the time being and it houses Atlas Cinema (Movie Theater), clothing shops, and souvenir shops today. Here, you can find authentic clothes, bags, and retro sunglasses. Halep Passage was built by a businessman named Haciyar Hacar in 1884. The building is in “Eclectic” style that brings a bunch of different architectural elements together and it boasts majestic reliefs at the same time. If you look carefully enough, you will see a medal on the front side of the building. The walls of a fortress in the middle of this medal represents Halep Fortress. As you can imagine, Mr. Hacar was from Halep and he included a symbol from his country on this building. The base floor of the passage houses various shops such as silver, ornament, book, oil painting, frame and poster shops. Moreover, you can take a break and enjoy a nice meal on the same floor at Munhasir Restaurant. Additionally, the lower floor of Halep Passage serves as Beyoglu Movie Theater today. The passage was built by a businessman of Greek origin named Kiryaki Hazzopulo in 1871 and it attracts attention with its front yard in the middle of the building. Hazzopulo Passage is a place with a lively atmosphere where you can see people having drinks and chatting at any time of the day. Highly valuable merchants of the non-Muslim community in the Ottoman Empire had businesses in this passage. One of the well-known figure, world-famous photographer Ara Guler’s father, ran a pharmacy shop in this passage too. In the past, all the hat orders for the marriages to be held at churches in Beyoglu were ordered to be made here and this shop named Sapkaci Katia sells nostalgic women hats today. There are 40 shops in Hazzopulo Passage where you can find perfumes, bags, ornaments, bookshops, and many more. The most important feature of the passage is that it connects Istiklal Avenue to Mesrutiyet Street. This passage was built by Aznavur family in 1893 and it reflects the Italian architecture style. Famous novelists of the late Ottoman period used to spend a lot of time in this passage that housed the best cafes and restaurants of its time. Aznavur Passage is a 9 story building where you can find ornaments, hat, toy, and bag shops. Furthermore, there are nice places to spend time such as cafes and a billiards hall in this passage. Aznavur Passage is located right across Galatasaray High School. 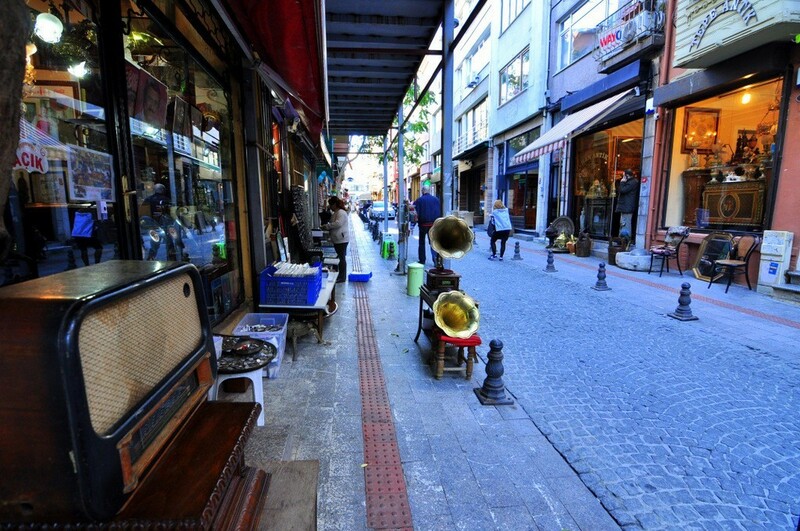 Avrupa Passage is a place that even most people who have been to Istiklal Avenue several times don’t know. As the entrance of the passage is through the Fish Market in Beyoglu instead of the main street, only people who know the place beforehand visit it. The big Beyoglu fire in 1870 caused a big change in the neighborhood. Avrupa Passage began to be built in the reconstruction phase of the neighborhood and it was completed in 1874. The passage was built in the Renaissance style by an Austrian architect named Domenico Pulgher. The building is 56 meters tall and it houses 22 shops. While you are in the passage, you can and should enjoy some amazing sculptures at the entrance of the shops. Moreover, the passage connects Beyoglu Fish Market to Mesrutiyet Street. In fact, Cicek Passage is the first place when it comes to the passages in Beyoglu. However, Cicek Passage is a place full of various fish restaurants and meyhanes. 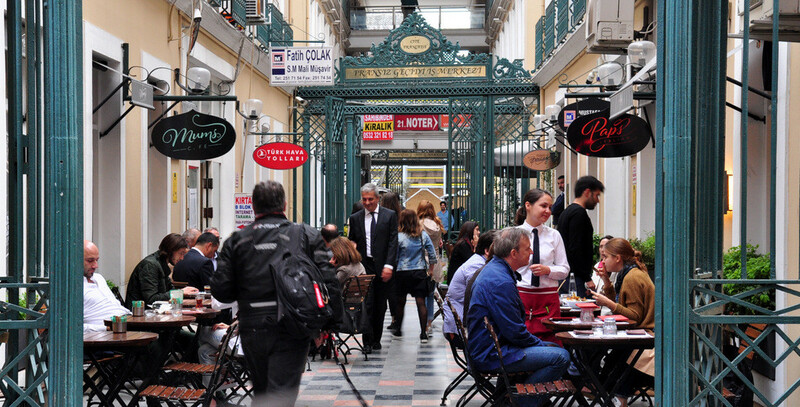 And if you plan to do shopping in Beyoglu, you may want to take a meal break in the nostalgic atmosphere of Cicek Passage. Beyoglu Fish Market, on the other hand, is next to the passage and it reflects the nostalgic characteristics of the neighborhood perfectly. While you are in the Fish Market, I strongly suggest you visit Uc Yildiz Sekerleme. You will definitely find yourself in a very nostalgic Turkish movie atmosphere. Beyoglu Is Merkezi (Beyoglu Business Center) feels like getting bigger when you walk in it. You will surely feel like you are in a labyrinth in Beyoglu Is Merkezi where export leftovers are sold in more than 200 shops. Therefore, you can find all sorts of things here, be it clothes, underwear, accessories, bag or shoes. Where to Shop for Cheap Clothes in Istanbul? Terkoz Cikmazi is on the right side of the way to Tunnel and it always feels like a local bazaar. You can find anything you need in these open-air street shops, be it underwear, jeans, and everything else. You can find really cheap t-shirts and dresses on the stands of these shops too. The actual name of Terkoz Cikmazi is D’andria Passage (built in 1882) but it was named after the street it’s located on. Alternatively, it is also called “Terkos Passage” by some. Galip Dede Street starts from Tunnel Square, where Istiklal Street ends, and takes you to Galata Tower. You can find various musical instrument shops on this street. These shops are around Galata Mevlevi House and they are popular among many professional and amateur musicians. Thanks to the impact of tourism in recent years, some souvenir shops have also popped up on the street. These shops sell colorful gifts and they offer more quality alternatives compared to the classical touristic souvenirs you may see in the Old City. This street stretches from Galata Tower to Cihangir direction and it houses shops that sell some specially designed products. These places present goods that are used in daily life in creative ways and they will definitely attract the attention of shopping fans. 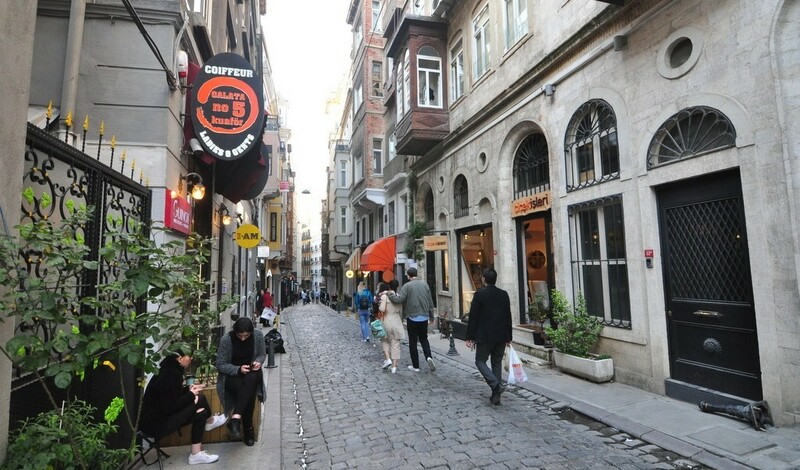 Moreover, some of the best cafes in Istanbul can also be found on this street. The tradition of bringing the shops selling the same type of products on the same spot began in the Ottoman era and it’s still kept alive in today’s Turkey. Therefore, you can come across places like Hirdavatcilar Carsisi (Hardware Market) or Mefrusatcilar Carsisi (Furniture Market) in the historical neighborhoods of Istanbul. And Buyuk Hendek Street is packed with shops that sell lighting products in the same way. Cukurcuma is a special neighborhood of Beyoglu. This neighborhood also houses the Museum of Innocence created by Nobel prize winner novelist Orhan Pamuk as a companion to his novel The Museum of Innocence. In fact, this neighborhood is famous for its antique shops and it’s such a fun activity to visit the antique shops lined up on Cukurcuma Street and do shopping. And if you love taking photos, you will find great opportunities to take some amazing shots here. Cukurcuma and Cihangir are two of the best neighborhoods to take a walk in Istanbul. Moreover, you can end your day on Cezayir Street to rest and enjoy your day even more. 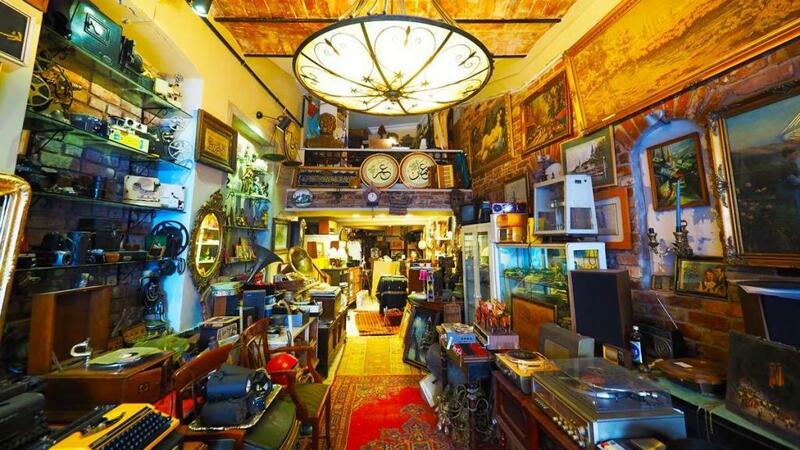 Where to Shop for Antiques in Istanbul? Karakoy is a cosmopolite neighborhood that served as the city dock in the Byzantine and Ottoman era. We formerly mentioned it in the History of Karakoy post that Karakoy used to be the place where valuable goods from the Silk Road were collected on both sides, Eminonu and Karakoy, of the Golden Horn and exported to Europe by the Italian trade colonies. This port neighborhood was always active in any period of Istanbul’s history and it blossomed completely in the 19th Century Ottoman era. Back then, Karakoy turned into a spot where all domestic and foreign businessmen of the city made investments. Therefore, you can also come across works of arts in Karakoy such as Minerva Han. 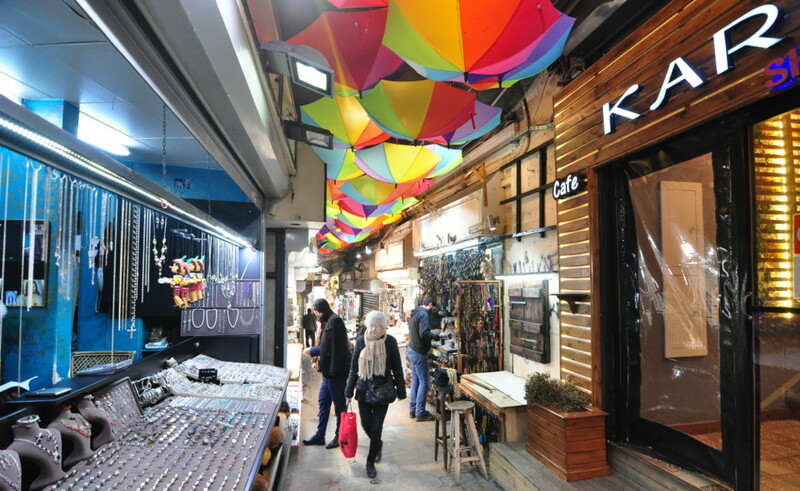 In today’s Karakoy, the shops that sell outdoor products are the most popular ones. There are some good quality shops with many options to choose from. One of these shops, Atlas Outdoor, which is also one of my personal favorites for winter clothes, is in Karakoy too. Moreover, you can visit Hirdavatcilar Carsisi where you can find various kinds of equipment. It’s on Tersane Street that stretches to the Golden Horn direction from Karakoy. On the other hand, Kemeralti Street from Karakoy to Kabatas direction is the spot where you can find diving equipment shops that are lined up one after another. 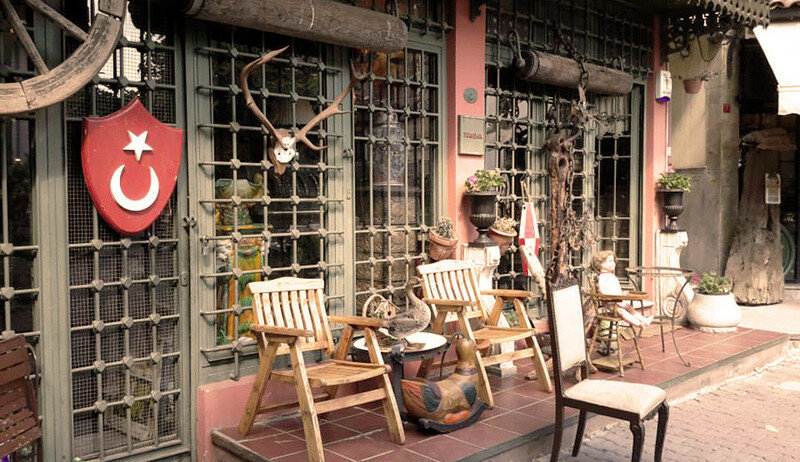 Apart from luxury shops, you can find specially designed product boutiques in Nisantasi. The most popular streets in Nistantasi are Abdi Ipekci Street and Mim Kemal Oke Street. If you are looking for an evening gown, you can visit boutique shops on the backstreets of Istanbul and find the trendy dress that you need. And Abdi Ipekci Street that stretches from Macka to Nisantasi boasts more than 50 luxury shops and it really feels like an open-air shopping center. Silky fabrics and spices from India used to be brought to Egypt via caravans for long years and they would be sent to Istanbul by ships. Then, these valuable trade products would be exported to Europe via Venetians and Genoese. And some of these important trade products would be sold to the public at Spice Bazaar. 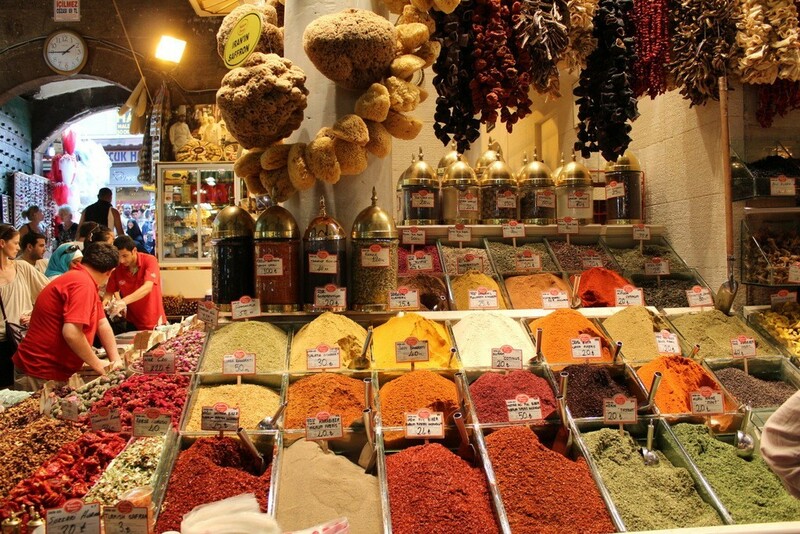 Spice Bazaar stands next to New Mosque, in the heart of Eminonu and it is still a center of attraction among both domestic and foreign visitors and you can’t even walk around the bazaar on weekends due to its huge popularity. Uzuncarsi Street has always been one of the shopping areas in the Old City since the Ottoman era and it’s the street that stretches from the Eminonu coast to Grand Bazaar. You can find various business centers, shops, restaurants and cafes on this street. If you wish to experience the nostalgic feeling of the Old City, I recommend you to visit this street. 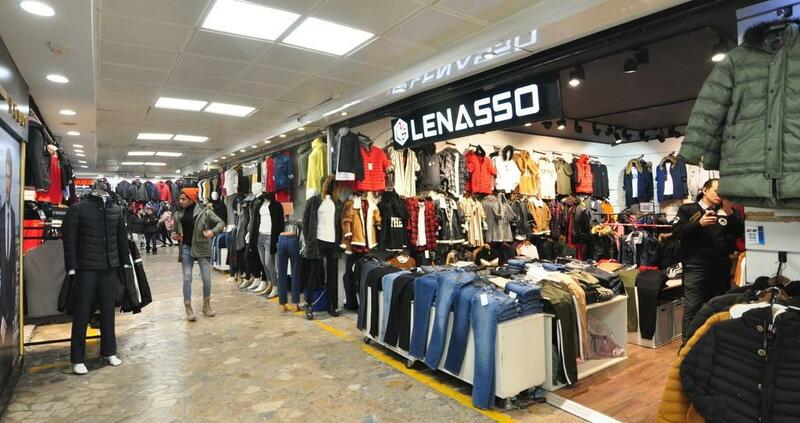 Moreover, you can buy a lot of shopping items for cheaper prices than some other places if you visit Uzuncarsi Street. The bazaar that starts from Grand Bazaar’s Mahmutpasa Gate and taking you to Eminonu’s backstreets is a steep road. This is the first place that comes to mind when people want to do shopping for engagement, wedding or circumcision events. Mahmutpasa Bazaar is a unique place where you can buy kids’ clothes, adults shirts or even underwear at really cheap prices. Where to Go Shopping in Istanbul Old City? Dogubank is located in the heart of Sirkeci and it has always been a popular spot for people who want to buy cheap mobile phones and technological devices. You can buy spot products at this place. You can also trade your old phones and buy new ones. Therefore, Dogubank offers a good alternative to do shopping. As we all know, photography products are really expensive. Products of big giants like Sony, Canon, and Nikon are sold at really high prices at techno shops today. And Hayyam Passage is the first place to look for cheaper camera and camera lens options in Istanbul. Many photography product shops are lined up one after another in this passage and, therefore, you can examine and compare the prices of the products you would like to buy at this passage. It was a tradition in the Ottoman era to build a bazaar next to a new mosque. Therefore, the resources to keep the mosque functioning, administrative and maintenance costs were met via the rents collected from these shops. In the same fashion, Spice Bazaar was built next to New Mosque in Eminonu. That’s the reason why these two buildings were constructed in the same year. 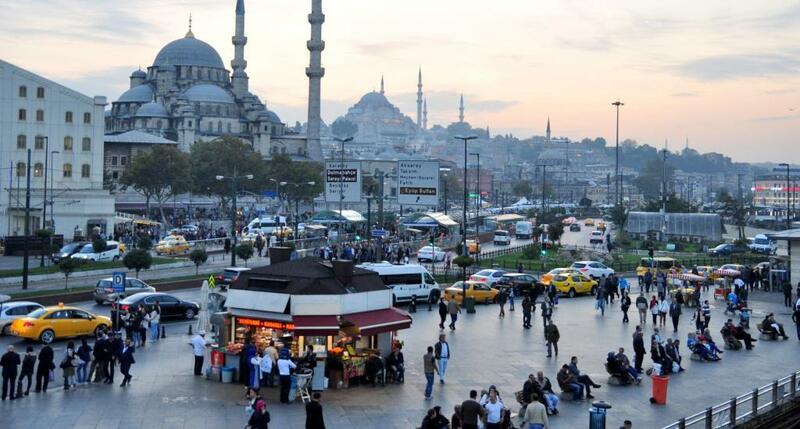 And Arasta Bazaar next to Blue Mosque was built to serve the same purpose in the 17th century. As the bazaar adjacent to Great Palace Mosaic Museum today, it attracts the attention of, especially foreign visitors. Souvenirs sold in this bazaar will surely attract your attention if you want to buy something that will remind you of Istanbul. Moreover, there are some famous shops in the bazaar, so much so that some of them have been mentioned in world-famous travel magazines like Jennifer’s Hamam. This street connects Sultanahmet to Grand Bazaar and it’s packed with tourists, especially in spring months. There are various office blocks, business centers, and coffee shops on this street. Additionally, you can find some luxury carpet and jewelry shops on Nuruosmaniye Street. Although this street is an expensive one to do shopping, you can chill at one of the cafes on the street and watch people from all around the world doing shopping. Grand Bazaar is the collection of numerous separate shops that have come together in hundreds of years. There are many sections of the bazaar and it’s composed of 67 streets and more than 3000 shops. 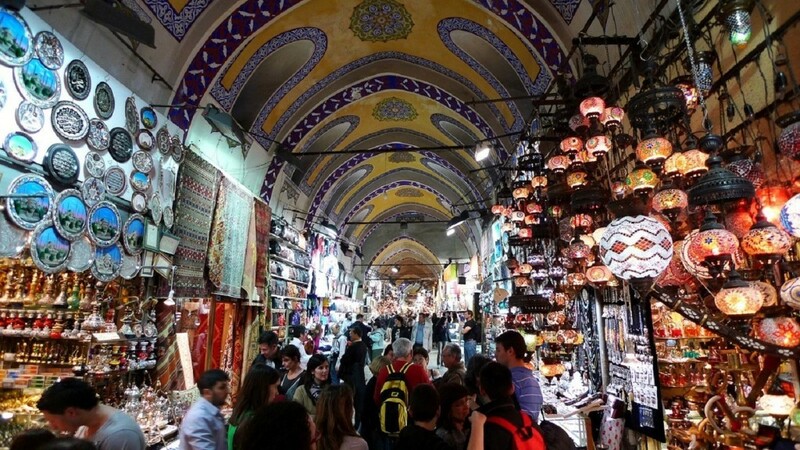 Therefore, it’s inevitable to get lost at Grand Bazaar if that’s your first time but getting lost in a huge bazaar as Grand Bazaar is what makes shopping much more fun. Naturally, there are many entrances and exits of the bazaar. Nuruosmaniye Gate (Gate Number 1) on Nuruosmaniye Street is the Main Entrance Gate of the bazaar. 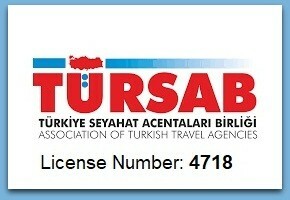 Also, Beyazit Gate (Gate Number 7) is one of the most popular entrances of Grand Bazaar. The street that lies between these two gates is called Kalpakcilarbasi Street and it’s regarded as the main street of Grand Bazaar. Therefore, in order to find your way in the bazaar, you are recommended to remember the direction of this street. Fener and Balat are highly popular neighborhoods in Istanbul recently. The best part of visiting these neighborhoods is that you can enjoy restaurants, cafes, cultural tourism, and shopping in the same area. After you start your day with a nice breakfast at a café nearby Phanar Patriarchate of Constantinople, you can take a walk on Vodina Street that connects Fener and Balat and visit some amazing retro shops in the area. When you enter Balat Bazaar, you will see some shops holding auctions on both sides of the road. In these shops, you can buy antique goods at ridiculously low prices. And that’s why you can also see people pouring out of such shops due to high demand. In order to take an unforgettable trip to Cibali, Fener and Balat, you can read Fener Balat Walking Tour and Breakfast Places in Balat articles. The most attractive thing about Kadikoy for foreign visitors is the atmosphere of Fish Market. Foreign travel writers who visit Istanbul recommend visiting Fish Market as it thoroughly represents and preserves Istanbul’s neighborhood culture and traditional shopping style. Indeed, Kadikoy dock and Fish Market are the reflections of hundreds of years of history. And some cool details that you may not realize on the European side due to the crowd and chaotic style, can be seen in Kadikoy’s Fish Market more clearly. For example, traditional dessert shops such as Tatlici Erol, Baylan and Haci Muhiddin Hacibekir make the bazaar colorful. Moreover, various second-hand book and clothes shops and souvenir shops on the way to Moda may attract your attention too. You can find everything you need regarding Istanbul on the backstreets between Fish Market and Bahariye Street. Culture and art centers, bars at Kadife Street, and Rexx Movie Theater are some other things worth visiting. Horhor Street and Cukurcuma are the first places when it comes to antique shops on the European side. And Tellalzade, which is between Kadikoy and Moda, is the most central place where you can find antique products on the Asian side. If you are interested in antique goods, the shops lined up on both side of the street will surely offer you interesting stuff. Where Do Locals Shop in Istanbul? Cilek Street used to host Old Tuesday Bazaar in Kadikoy but it houses only shops nowadays and it’s among the most popular shopping spots in Kadikoy. Cicek Street is right across Altiyol (Bull monument and nearby), which swarms with people on weekdays, and you will see a hat seller at the entrance of the street that has been there since forever. On this street, you can find trendy dresses at boutique shops that are lined up across each other. Moreover, you can also find makeup products and shoe shops too. Bahariye Street is one of the best places to take a walk in Kadikoy. This street stretches from Kadikoy’s famous Bull monument to Moda and a nostalgic tram passes through the street like the one on Istiklal Avenue. And there are some other nostalgic elements on the street such as Sureyya Opera. 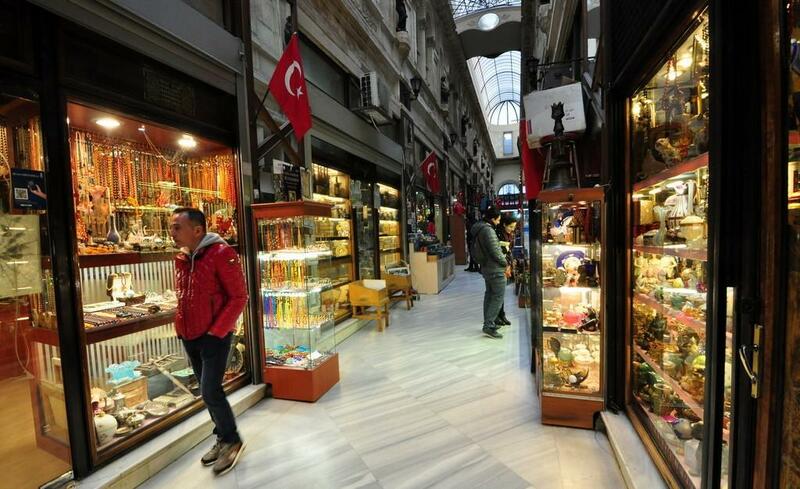 Opera Onur Carsisi is an ideal passage to do shopping cheaply. If you need a nightgown or daily sportswear, you can find similar stylish products like expensive brands. 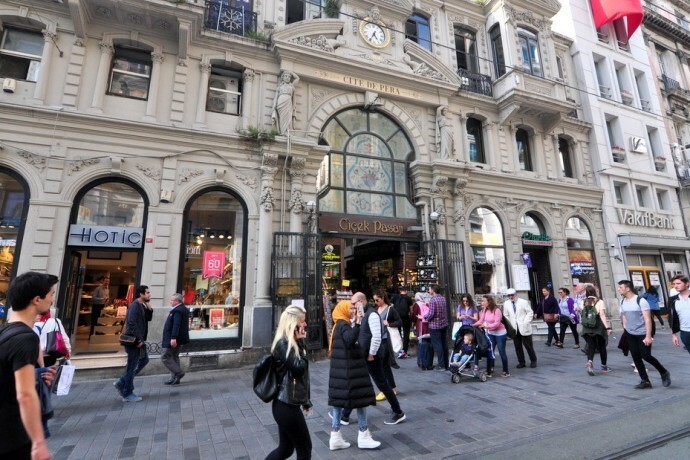 Bagdat Street was Istanbul’s one of the most popular shopping spot till 3-4 years ago. However, it fell victim to the urban transformation in the area and, therefore, some shops had to be closed. This is why Bagdat Street has kind of lost its former charm. However, despite all setbacks, Bagdat Street continues to be a center of attraction like Istiklal Avenue. 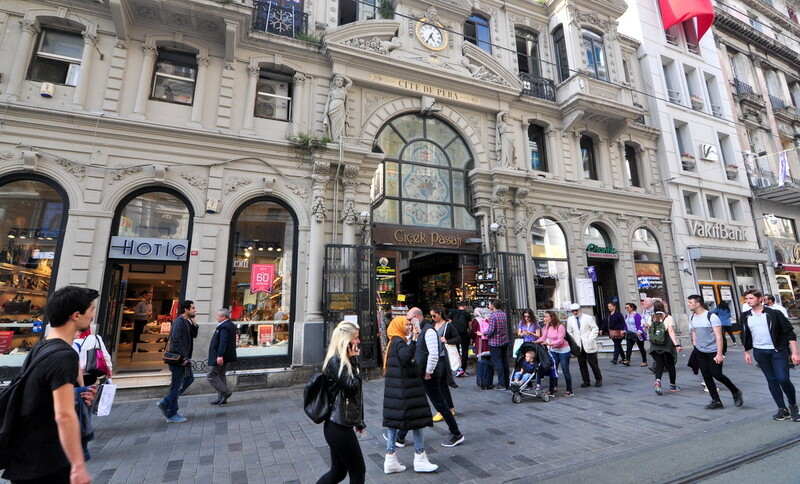 Its 7km length makes Bagdat Street the longest shopping street in Istanbul with its luxury brands’ shops. Bagdat Street starts from Bostanci and continues to the center of Kadikoy. Especially, Saskinbakkal, Caddebostan, Goztepe, and Selamicesme areas offer nice shops, cafes, and parks. Also, wedding dress shops, nightgown shops, and plates studios can be seen on the top floor of apartments on the street.